The Works Of Shakspere. Edited by Charles Knight. Imperial Edition. With Illustration in Steel. London: Virtue & Co. No date. Circa 1875-80. New York, Patterson and Neilson. Two Volume Set. Folio. Illustrations from pictures by C. W. Cope, W. P. Frith, C. R. Leslie, D. Maclise, E. M. Ward, C. Clint, H. S. Marks, W. Q. Orchardson, C. W. Sharp, W.M. Lizars, C. Cousen and others. Contemporary half black leather with green cloth boards and gilt emblem front boards; raised ribs and title and pattern in gilt to spines. All edges gilt. Marbled endpapers. Text pages printed with double columns. Plates are printed on fine heavy paper. Boards and edges have moderate rubbing (see pictures); gilt remains bright and binding is firm. Contents are in near fine condition with flaws noted as follows: Volume I, has light and small foxing marks to the preliminary pages and tissue guard is missing from one plate; Volume II has very small water droplet marks near tail edge and outside of illustration in a few plates. Volume I, 800 pages with notice of the original editions of the plays. Comedies and Histories. Frontispiece portrait and engraved title page plus 24 plates. Volume II, 778 pages. 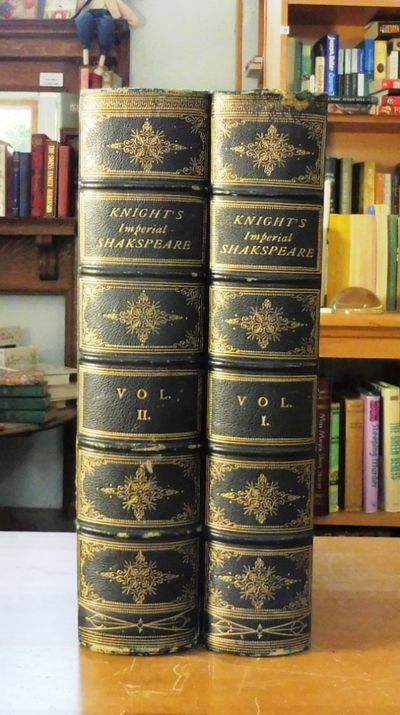 Histories, Tragedies, Poems and Plays ascribed to Shakespeare plus a brief notice of opinion on the writing of Shakespeare and Indexes; engraved title page plus 17 plates. An important study of Shakespeare's life and works, based primarily on the first folio. "The text given by Mr. Knight... is founded upon the most careful collations; and a reason is assigned in those editions for every deviation from the received text of the modern copies. To print the Text of the Words of Shakespeare, such as we may judge that it proceeded from his pen, so as to make his real words accessible to all, is the object...".